The flexor carpi ulnaris is a forearm muscle and can induce pain in the wrist if it gets overworked or develops trigger points. On this page you will learn about this muscles’ functions, insertions, pain zones, palpation and massage. Furthermore you will get known to what movements and actions are prone to overload this muscle and which movements can be impaired or painful as a result of that. If your flexor carpi ulnaris is too tight or harbors trigger points, it can induce pain at the ulnar side/outer side of your wrist. Furthermore the pain can radiate into your forearm and hand. The deeper the red in the picture, the likelier it is to experience pain in the respective area with excessive muscle tension or trigger points being present. If your flexor carpi ulnaris is very tight or contains trigger points, you might have problems bending your hand and flexing your fingers. It may become so bad, that even holding a cup of coffee becomes too much. This is because this muscle can compress the ulnar nerve if it is too tight and thus irritate your nervous system massively. Of course, all activities that created the problems in the first place, will be painful too. What you have to do now, is to locate the tender spots in this muscle and massage them in order to achieve relief. Proximally this muscles fastens at the medial epicondyle and at the olecranon. Distally it attaches at the pisiform bone, which is a small bone of your wrist joint right below your pinky. As its name already suggests, it flexes your wrist. Furthermore it deviates your wrist in a way that your pinky is moved towards your forearm. Last but not least it supports the flexion of your fingers. As with all the other flexors of your forearm, this muscle gets overloaded by excessive gripping motions. You will realize that you use your hands to an enormous extend in your daily life. Still, due to our mostly sedentary lifestyle, those motions are rather „undemanding“ in terms of the load that is placed upon them. As a result, these muscles are not well trained and more susceptible to trigger points if used heavily. Satellite trigger points in this muscle can develop or reappear if triggerpoints in the pectoralis minor, latissimus dorsi or the serratus posterior superior are present. So in case, you only get transient relief, check out those muscles! I recommend feeling this muscle during contraction. 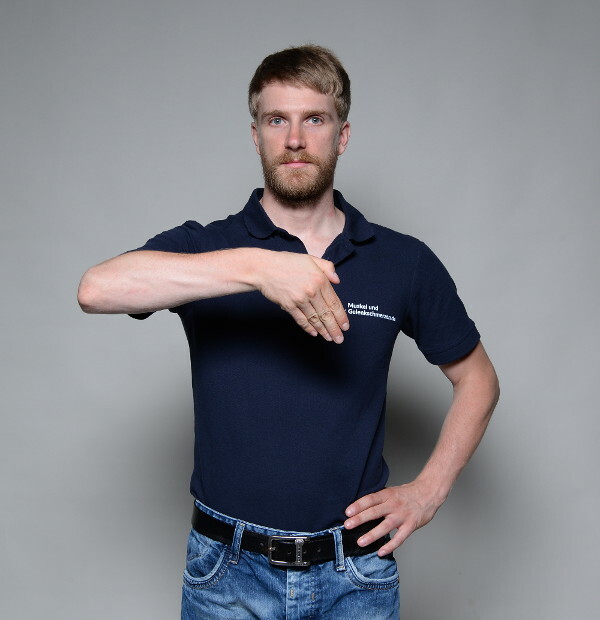 Just place one or two fingers on your medial epicondyle and then bend your wrist in a way that your pinky is moving towards your forearm. Make sure to really bend your wrist as far as it possible for you as only then you will feel the muscle properly. If you are not able to palpate/feel the muscle, don’t worry. It is not the end of the world as you know that it attaches at your medial epicondyle, which you will be able to feel without problems. For massage you can use your fingers or a massage ball against a wall. In both cases, place your massage tool on the muscle and search for tender spots. As soon as you find one, massage only that spot for 10 – 15 times with very short and precise strokes. If you use your fingers for massage, use the supported thumb technique to save your joints. No matter what tool you choose, make sure to stay on the muscle and not to hit the ulnar nerve. If you hit it, you will experience a tingling and/or burning sensation, which will be your sign to get back on track onto the muscle.